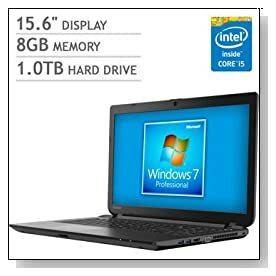 15.6 inch Toshiba Satellite C55-B5295 is one of the best computers of Toshiba C50 series so it’ss not as low cost as others but seems to offer better value for money with its 4th generation energy efficient Intel i5 processor, generous amounts of hard drive and memory, Intel HD 4400 graphics for adequate graphics performance for anything other than gaming but the same 720p resolution standard TruBrite screen and one of the best things about it is that it comes with Windows 7 so overall happens to be a better choice of all the C series but not as good or as expensive as the Toshiba L, P or S series machines. Toshiba C55 comes with the dual core Haswell Intel i5-4210U processor at 1.7GHz base speed up to 2.7GHz with turbo boost when required by tasks at hand and stay at base speed for light stuff to save on power, 8GB DDR3L SDRAM at 1600MHz for better multitasking but is not user replaceable, 1000GB Serial ATA hard drive at 5400rpm rotating speed and HDD recovery and the 64-bit Windows 7 Professional. Intel i5 CPU has a passmark benchmark score of 3440 on the day of this review and a TDP- Thermal Design Power of 15 W including all the bits and pieces, being an ultra low voltage processor but it is capable of handling daily or more demanding multimedia and office tasks. 15.6 inch diagonal widescreen TruBrite TFT high definition LED backlit screen with 1366 x 768 pixel resolution- 720p content and cinematic 16:9 aspect ratio means regular quality images with clarity and adequately vibrant colours. Mobile Intel HD 4400 is the built-in graphics card with shared graphics memory with the main processor and performs up to 20-30% faster than Intel HD 4000 but a little slower than the higher 5000, and can be compared to the discrete Radeon HD 7550M, meaning you can play some of the high end games at low settings and older and less demanding titles at medium settings and resolution. Sound quality is nothing to brag about, is just OK through the integrated stereo speakers and you have the standard high definition webcam with built-in microphone to chat on Skype or video conference for work purposes. 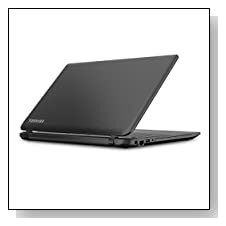 Textured resin in jet black Toshiba Satellite C55 weighs 4.85 pounds with measurements of 15 x 10.2 x 1.1 inches - fairly slim, lightweight and portable with its 15 inch display and has a 4-cell 45WHr lithium ion battery that should offer around 4 to 5 hours on average. It has a standard black US keyboard with a 10-key numeric pad and a touchpad pointing device that supports multi gestures. There is no Smart Card Reader and no Bluetooth or antenna by default but 802.11bgn wireless, 10/100 Ethernet 100Base-T LAN with RJ-45 connectivity, 2 x USB 2.0 ports, a USB 3.0 port, DVD-SuperMulti drive (+/-R double layer), Memory Card Reader, an HDMI port, a VGA port, Microphone input / Headphone output combo and a Security Lock Slot. Bluetooth USB dongles can cost as low as a few dollars which you’re welcome to order with your purchase of this computer. Conclusion: Toshiba Satellite C55-B5295 is a great performer at home, school or work, is comfy to use and can handle most tasks with ease thanks to its solid hardware that also makes it feel durable, 4th generation Intel i5-4210U processor, 8GB memory and the Professional Windows 7 rather than the less user friendly Windows 8 and is offered at a decent price. It comes with one month trial versions of Microsoft Office 365 and Norton Internet Security which you should probably swap with the free AVG or Avast online as well as 12 month standard limited warranty for parts and labour. It is EPEAT Gold registered and Energy Star qualified partly because of having an ultra low voltage processor. Toshiba is a great global brand for laptops too and you can expect good quality- solid and durable hardware that should last you longer than normal. Mousepad with the separate left and right clicks is criticised for being to the left rather than in the middle and apparently sound quality is not the best but you are getting quite a bit for your money, including speed, performance, connectivity options and build quality.